What Is a DVD Recorder/VHS VCR or DVD Recorder/Hard Drive Combo? Magnavox MDR-865H DVD/HDD Recorder (top), Funai DV220FX4 DVD/VCR Recorder (bottom). A DVD recorder combined with a VHS VCR. A DVD recorder combined with a hard drive. 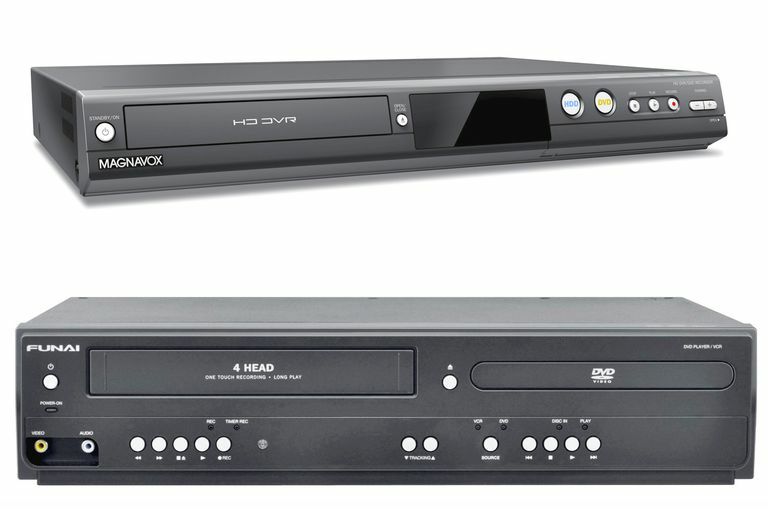 Up until 2010, DVD Recorder/VCR combos were very common, but are now very scarce, especially since the needed mechanisms for the VHS VCR section have been discontinued. You may still be able to find one on clearance or used. All of these types of combos feature the same type of connections you will find on a VCR or DVD recorder, with the addition of HDMI outputs on many made after 2007. One benefit of a DVD Recorder/VCR combo is that it also features VHS-to-DVD and DVD-to-VHS internal cross-dubbing capabilities for non-copy protected DVD and VHS videos. However, if you already have a working VCR that you don't need to replace, and you buy a separate DVD recorder, all you would have to do to copy from the VCR to DVD using a DVD recorder is to hook up the VCR's AV outputs to the AV inputs of the DVD recorder (which works much like a VCR) and simply copy your video (if non-copy guarded) to DVD. Another thing to consider is that not all DVD recorder/VHS VCR combos have built-in tuners, and those made before 2007 that have them might be analog rather than digital, since 2007 was the beginning of the analog-to-digital broadcast TV transition that was finalized in 2009. What this means is that if you have a combo unit that does not have a tuner or an older analog-only tuner and receive your programs using an antenna, you will need to connect an external DTV converter box to the combo unit to record TV programs. On the other hand, if you are on cable or satellite, if your box has a set of composite and analog audio inputs, you can use that connection option for any DVD recorder/VHS VCR combo. There have been DVD recorders from a few manufacturers that include both a hard drive and a DVD recorder in the same unit, but as of 2010, they have become increasingly rare in the U.S., although they are common in Asia and Europe. A DVD recorder/hard drive combo is actually very practical, as it allows the user to copy raw footage or record a series of programs to the hard drive and then copy or edit smaller segments or the entire contents of the hard drive to a blank DVD. Another benefit of this type of unit is that the recorder can be set up so that if the DVD runs out of space during recording, the excess video is automatically recorded onto the hard disk, which, once again, can be copied onto another blank DVD at a later, more convenient time. Also, on some DVD/hard drive combos, you can pause or rewind live TV. The way this works is that the hard drive can be set up to record while you are watching a live channel and continues to record when you rewind or pause live TV. This is practical if you are interrupted by a phone call, or missed some dialogue in the action. The hard drive feature on a DVD recorder is very useful for temporarily storing your video, either from your camcorder, TV programs, or other video sources before recording to DVD. However, you can record video directly to DVD, if desired. On the other hand, if you record to the hard drive first, you can even do some basic editing before putting your video on DVD. You have to remember that the DVD recorder's hard drive is for recording video and audio only; you cannot use it to interface with a computer for storing other types of files. Unlike DVD Recorder/VHS VCR combos, all DVD recorder/hard drive combos have built-in tuners, but if made before 2007, you may still need to use a DTV converter box for receiving and recording programs unless you are on satellite or cable. Another interesting feature that has been included more recently, as a way to extend the practicality of these devices, is the incorporation of twin-tuners in some units that allow the recording of two different digital broadcast channels at the same time, or watching one channel and recording another. It must be re-emphasized that manufacturers, such as Sony, Pioneer, and Panasonic, have stopped making DVD recorder/hard drive units for the U.S. market. On the other hand, they are still available in Europe and Asia (as are Blu-ray Disc recorders). This is due to several reasons. What is really interesting is that despite the severe reduction in the manufacturing of DVD recorders of all types, there is still a fan-base that is willing to pay a lot of money to get their hands on these devices.